If you thought quinoa was just for hippy vegans, think again! 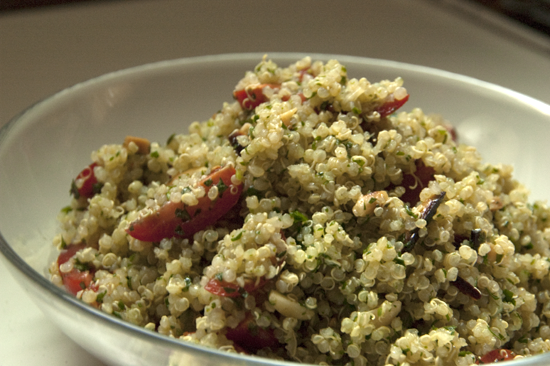 Pictured above is an herb and quinoa salad tossed in a lemon dressing. Here's what you do: add finely chopped herbs (I used mint and Italian parsley but cilantro works too. ), freshly toasted almond slivers, small-diced sweet onions (or green onions) and tomatoes, if you have them. The dressing is just a vinaigrette made with Meyer lemon instead of vinegar. Don't forget the salt. It's that easy, and lots of room to play around with flavors. So tell me, how do you enjoy quinoa?